When giving new miners on-the-job-training, an instructor's job is to stay out of the way and let the head teachers -- fear and pain -- run the class. I climbed onto the small, two-person electric cart that we used to travel through the out-by areas of the mine and to perform my daily inspections. I motioned for Lonnie Jr. and Kenny to climb aboard. They both gave me a look of confusion and fumbled in an attempt to fit both of their bodies into the area designed for a single person. I laughed with them, not at them, as I tried to explain. Lonnie Jr. sat down first trying to pull his knees to his chest as tight as possible. His round belly prevented his knees from getting within a foot of his chin. Kenny then turned circles, like a dog making a bed, trying to find a way that his body could somehow fit into the small space left over in front of Lonnie Jr. I felt sorry for the two kids. I remember how terrifying my first day underground had been. I wanted to offer them advice, but I knew as their supervisor I had to give them tough love or they would never make it beyond me. There was a fine line between giving advice and assistance and being too soft. If I was too soft on them they’d be overwhelmed the minute they went to work for another foreman and most likely quit. I didn’t want to see anyone go through the stages of denial, regret, fear, and the struggle of not knowing if this was the job for them, because whether we liked it or not, this was the ONLY job for us in our hometown region. What Kenny didn’t know is that riding on the front deck, which was much like the hood of a car, was a completely normal thing to do. It wasn’t safe or comfortable, but we had all done it on more than one occasion to avoid walking. Kenny also didn’t know he was in for one of the most uncomfortable, and possibly most painful, rides of his life. He had on a mining belt with a light pouch, battery light, wrench, hammer, and screwdriver. All placed under his body. He had sandwiched all of these tools between his clothing and the steel plate of the man trip. Every bump, rock, small vibration would cause those tools to dig into his hip and ribs as we traveled through the mine. This was his chance for a learning experience, the hard way. My words ended just as Kenny’s body entered the portal and the darkness of the mine. I decided I would have a little fun with these two miners and give them a good laugh before things got too serious. I flipped off the switch to the headlights of the mantrip and put one hand over my cap light. Everything went dark. The new miners had forgotten to turn on their cap lights as I had asked them to do. I let the cart travel at its own speed. The weight on the cart propelled us down the slope and in total darkness. Even I was feeling a bit uncomfortable. As we bounced on the first landing and sped down the next descent both Lonnie Jr. and Kenny began to panic. I calmly applied slow pressure to the brakes, turned on the headlights, and uncovered my cap light. I watched Kenny and Lonnie Jr. clumsily try to find the rotational knob on the side of their cap lights while their nerves and the vibration of the ride prevented them from securing their fingertips to the tiny knob on the side of the light. I stopped the cart at the bottom of the slope and turned off the directional light to notify anyone wanting to enter the mine that the slope was clear for travel. Kenny and Lonnie Jr. finally managed to get their cap lights turned on and as I looked at their faces I could see into their eyes. They were furiously looking in all directions trying to take in everything. I imagined myself on my first day. Did I look like this to the other miners or were they too concerned with snorting their Lortab and Xanax to notice the innocence and ignorance that I possessed that day. I took a second to focus on the two miners, both barely 18 and eager to follow in the footsteps of the generations before them. I was not a decade ahead of them in age, but in that moment I felt somewhat like a father to them. I felt like there was something more important for me to do. I had an opportunity to pass on to these two kids the same things that miners like Lloyd, Aaron, and one of my childhood heroes, Tom Richardson, had passed on to me. 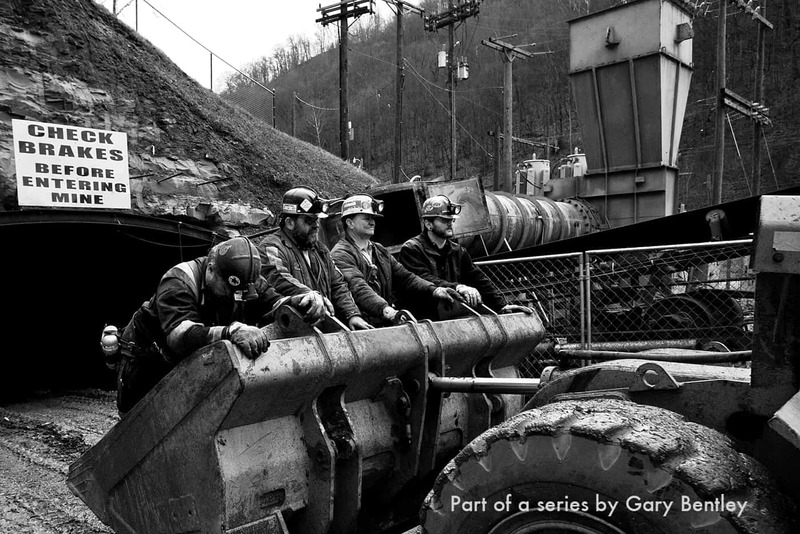 Gary Bentley, a native of Eastern Kentucky, mined coal underground for 12 years. He currently lives in Lexington, Kentucky.